UK Seikatsu suggested Yakushima (屋久島 / a small island in Kagoshima Prefecture), yakitori (焼き鳥 / grilled chicken), yakibuta (焼豚 / grilled pork), yakiimo (焼き芋 / roasted sweet potato), yatsume-unagi (八目鰻 / lamprey eel), Yamaguchi Momoe (山口百恵 / a former singer/idol in 1972 – 1980), and Yamada Yoji (山田洋次 / a film director); Zooming Japan suggested Yakushima, Yaeyama-shoto (八重山諸島 / Yaeyama Islands), and Yamaguchi-ken (山口県 / Yamaguchi Prefecture); Japan Australia suggested yakitori, yakisoba (焼きそば / stir fried noodles), yatai (屋台 / mobile food stall), Yakushi-ji (薬師寺 / a temple in Nara), and Yamadera (山寺 / a temple in Yamagata Prefecture); and Paul suggested yakuza (ヤクザ / members of organised crime groups), Yasukuni Jinja (靖国神社 / a shrine in Tokyo), Yamanote-sen (山手線 / circular JR train line in Tokyo), Yamato (大和 / ancient, mythological name for Japan), and Yamaha (ヤマハ株式会社 / a company which makes musical instruments, electronics, motorcycles and power sports equipment). 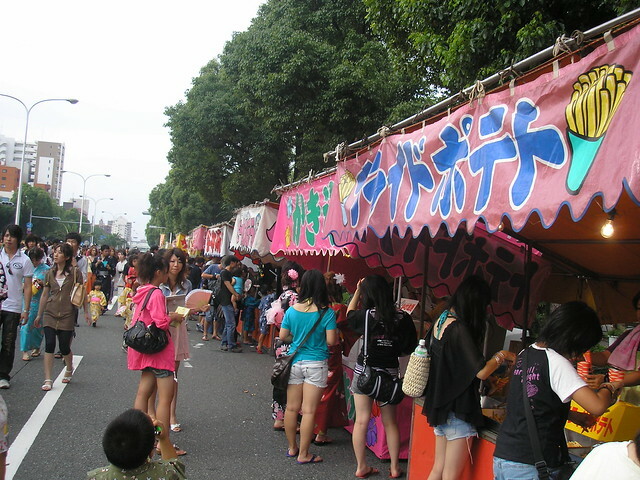 If you’ve ever attended a festival in Japan there’s no doubt you would have seen ‘yatai‘, which are mobile food stalls. 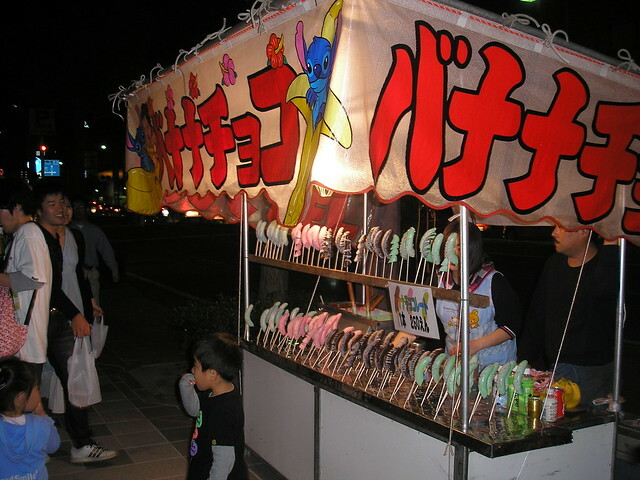 When festivals are on the streets are usually lined with yatai selling all sorts of food, from grilled chicken to squid on sticks, chips to chocolate bananas (choco banana / チョコバナナ)! Although the stalls do sell a kind of junk food, it’s usually much more appealing than the burger vans we have at events here in the UK. In fact, one of my favourite things to get is ‘jyaga butter’ (じゃがバター) – a baked potato with butter and salt. 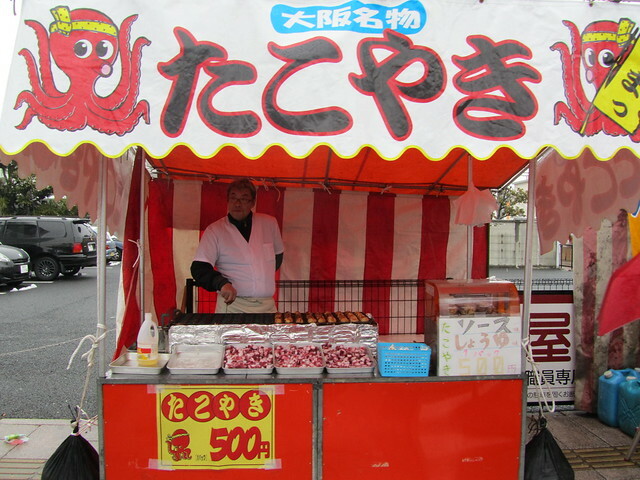 One of the classic yatai foods is takoyaki (たこ焼き) – grilled balls with pieces of octopus in them. They’re so good! 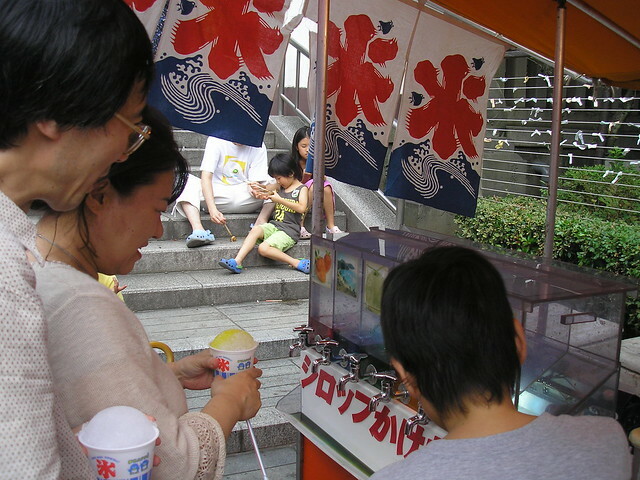 Summer festivals are also known for selling kakigori (かき氷) – shaved ice with various different syrup toppings. 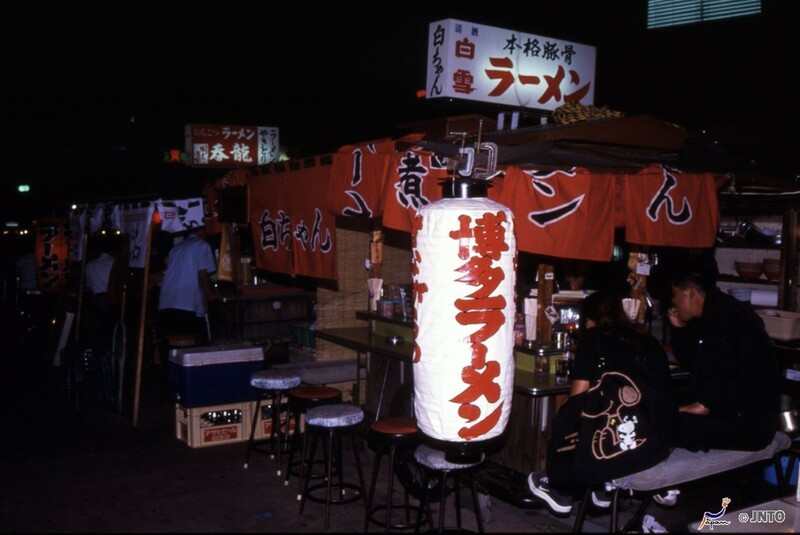 Although yatai are usually connected with festivals, any mobile food stall is actually a yatai and some towns have areas where food stalls open regularly in the evenings. 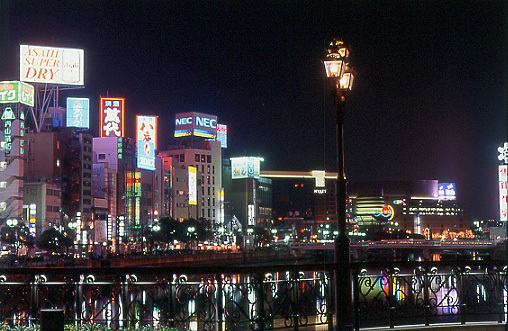 One of the places in Japan that’s most famous for its yatai is Fukuoka (福岡). Yatai are scattered all over Fukuoka, but the most famous place to see them is on the southern end of Nakasu Island, in the middle of the city. The yatai line the side of the water, all lit up at night, creating a really interesting atmosphere. Hakata Ramen (ramen noodles in a pork bone-based soup) is one of the most popular dishes to eat at yatai in Fukuoka. The yatai in Fukuoka are usually open from 6pm every night (depending on the weather), and are very popular on Friday and Saturday nights. I’d love to check them out one day! So, if you’re in Japan or planning to go, make sure you check out some yatai if you can! Enjoy the food! Next week we’ll start with ゆ (yu), so please leave a comment below suggesting a topic for things beginning with ゆ. Topics can be anything, as long as they are connected to Japan – food, places, people, characters, whatever you want to hear about! Just remember that the words you suggest must be Japanese words. Thanks for using my suggestion this week 🙂 I love all the summer festivals they have here in Japan and a big part of that is all the festival food at the yatai. mmmm… Hakata Ramen. My favourite! Yurakucho (area south of Tokyo station with dozens and dozens of small restaurants and izakaya underneath the elevated railway lines). Yumoto Onzen (Hot springs resort near Nikko).